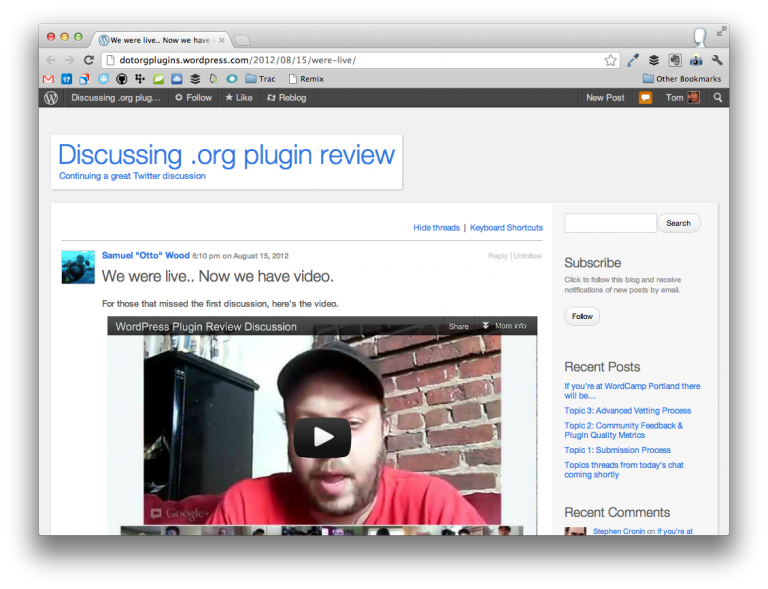 Generally speaking, I absolutely love the idea of improving the overall WordPress Plugin repository. It is plagued with plugins that work inconsistently across hosts, that have low quality code, and that have UI’s clearly built by developers who have been left on their own to come up with how stuff should look (of course, some are great). Saturday night, I chimed in with a few thoughts because this particular issue is something that’s near and dear to me, and because I think anyone who is building plugins should take a few minutes to read through and share their opinions. Sure, some may disagree, but that’s no big deal – it’s what these discussions are about! I dig building plugins. So much so, in fact, that I’ve killed ones the ones that I no longer maintain in order to improve focus on one’s that I’m currently working on and that I want to build. I don’t believe the plugin system is completely broken – listening to Matt’s State of the Word 2012 shows that – but there is room for improvement. If nothing else, developers need to do their due diligence in learning the WordPress API when building plugins. I do believe that there is danger in having design by committe and though I absolutely love that a number of us have shared our thoughts, agreed, disagreed, and are working to make this better, I think that a core group will ultimately need to be created ala the core team for WordPress itself. Time is a limited resource for everyone. I love that there are so many people working to improve this particular area of WordPress. I don’t know how far I’ll personally be able to stay involved, but even tracking with it and taking part in the initial conversation has been fun. With that, I urge you – and anyone else who builds plugins for WordPress – to get involved at some level. If you’re at all interested, at least do your due diligence and read through the discussion. Add your thoughts, get the word out, and do what you can to help improve the process.